Of all of the beautiful places in Montana, the Smith River is one of the most sought-after. 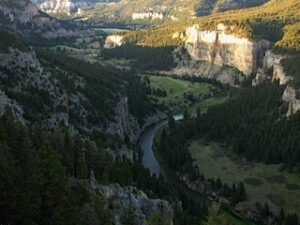 Located in the heart of Montana, the Smith River corridor is still untouched by major developments and offers breathtaking views, tall limestone canyons, excellent fly-fishing opportunities, and an experience of a lifetime. Our Smith River trips are 60-miles of adventure, floating for five days and camping for four nights. Of 73 commercial permitted trips available each year on the Smith, Lewis & Clark Expeditions is the largest outfitter on the river. This translates into more available and flexible trip dates we can offer our clients. Lewis & Clark Expeditions begins the float season in early May and typically ends the middle of July. The emphasis of our trips is on fly-fishing, with each bend beckoning the angler to tempt a trout to the fly. Anglers have a 50/50 split between rainbow and brown trout with the average size being 13″ (an average size for a Montana trout that inhabits a freestone stream). However, there is very healthy population of trout in the 16-18 inch range and enough 20-inch trout to keep you actively engaged in each cast for 60 miles. If I was granted only one more fly fishing trip in my lifetime, I would be launching a boat down the Smith River by morning light. The river still has pristine wilderness, which is why we live in Montana. A good guide is the most important thing to have on the Smith, they are your short cut to fly fishing success. Lewis & Clark Expeditions has good guides who love what they do and know the Smith River and the techniques you need to catch fish. Spring on the Smith is the combination of high, discolored water along with periods of clearing waters. The high water comes from runoff occurring at different elevations. You can be fishing the Smith in 70-degree weather in May using dry flies and 24 hours later the river is high and discolored. Discolored water leads to San Juan Worms (although a San Juan Worm is good anytime and anyplace) and also leads to fishing with solid dark patterns for nymphs and streamers as trout will distinguish a solid shape quicker. All trout rivers fish better as they are clearing and the water begins to recede rather than when rivers rise quickly. This is an absolute. Las Vegas would phrase it this way: fishing rivers as they clear 2-1 advantage fishermen. Rivers going up Trout have a 6-5 advantage. The Smith River is a free stone stream with very healthy stonefly populations. Mother’s Day produces caddis hatches and Salmon flies emerge around Memorial Day. Golden Stoneflies are more prolific emerging June 15 through the first week of July, followed by PMD’s in late June and a hit and miss Green Drake Hatch. We also have years where Cicadas take over the river. The best and most productive dry fly fishing days have clouds associated with them. Trout are wary with direct sunlight, but give them a few clouds and the advantage can again move in favor of the angler. Fishing the Smith is for anyone that wants to have fun. There is direct correlation between how well someone can manage their fly line and how many fish they can catch. Managing fly line means using the right amount of fly line to cast ,which normally, less is best. Anglers need to be able to either mend the line in the air or on the water to set up drag free drifts. When the moment of truth arrives (when the fish hits the fly) a well-managed fly line results in more trout. As far as equipment, entry-level fly rods and reels these days are excellent. High-end rods and reels are really excellent. I favor the Orvis Helios 2, nine foot five weight or six weight. I know fly rods are inanimate objects but the Helios 2 courses right through my body when I am casting, setting the hook and playing a fish. The rod is the conduit between the fish and me, which then becomes something more than fishing. The connection with a trout approaches the divine. Each day, our experienced guides will float you down a section of river for a great day of fishing, provide lunch, snacks and refreshments, and at the end of the day arrive at our camp. Freshly made hors d’oeuvres, beer, wine, and refreshments await you, followed by a delicious riverside dinner prepared for you by our talented staff. All meals are prepared fresh each day and include fresh fruits and vegetables; full breakfasts and lunches. For dinner: soups and salads; entrees include fish, pork, chicken and beef; you can also look forward to a variety of desserts. Drinking water, fruit juice, milk, teach coffee, pop, beer and wine are provided as well. We can accommodate special dietary restrictions and preferences by making arrangements with us at least two weeks prior to your trip. Our staff prepares the camp for you each day with tents (individual or shared, your choice), cots, therma-rest pads, transport your personal gear; solar showers are also available, dining table, chairs, and campfires. As you wait for your rod to bend, you can take in the natural beauty of the Smith River, which perhaps, is best known for its extraordinary limestone canyon walls. There will be plenty of chances to stop and wade fish, take photos of wildlife, check out the points of interest (caves and pictographs) and admire the landscape as you float downstream.